This listing is for a ring kit featuring one of my lampwork glass beads. 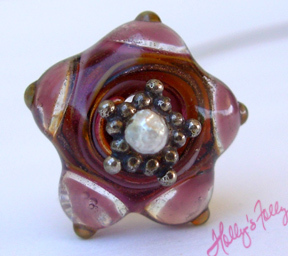 The bead is a purple star-shaped disk bead measures 6 mm tall and 18 mm wide. To read more about the rings and what you will be getting, READ THIS LISTING. I found your post comments while searching Google. Very beautiful lampwork beads!!! Regularly I do not make posts on blogs, but I have to say that this bead really forced me to do so. Really awesome art glass. Really fantastic and I will be coming back to buy some glass beads! Thank you.